During the upcoming Kootenai River Stampede PRCA Rodeo happening July 27 and 28 at the J. Neils Arena north of Libby, spectators will be delighted by an international star who has been putting smiles on faces for years. This fan favorite, hailing all the way from Stephenville, Texas is known by all his multitude of fans as… Whiplash – the Cowboy Monkey. 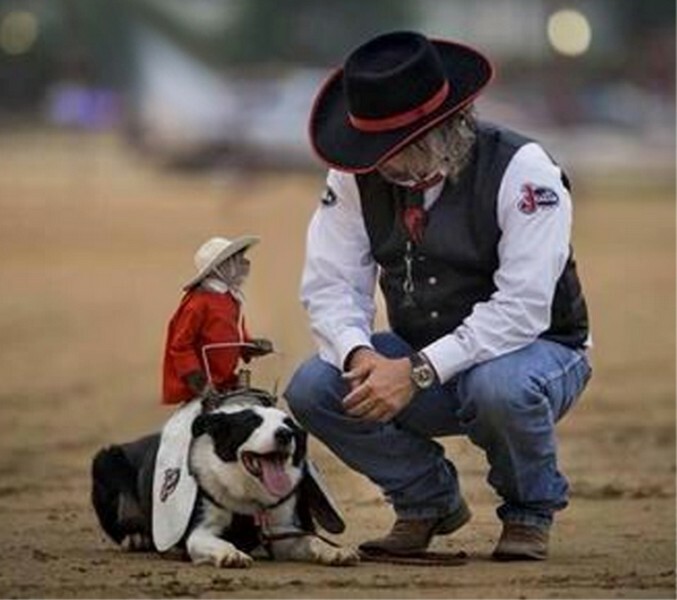 Whiplash is the world’s smallest cowboy who is a three-time Pro Rodeo Entertainer of the Year. 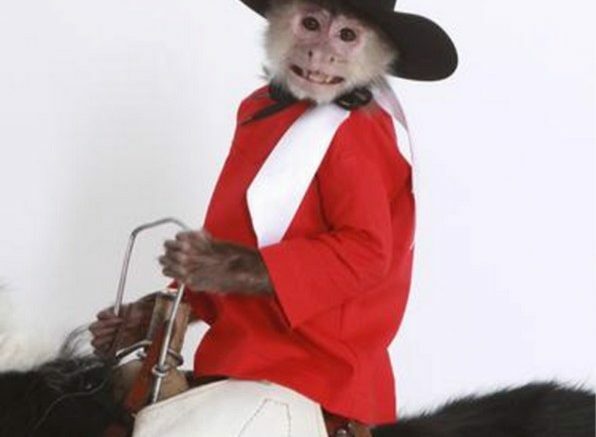 He is a two-foot tall, eight pound Capuchin monkey who has been riding since he was two years old. He travels around the country herding wild Barbados sheep at rodeos and other events. Dressed in his custom cowboy hat from Capital Hatters, Buck Wild custom wild rag, chaps and Justin boots, Whiplash never misses a chance to show his skills and cowboy spirit as he rides his trusty Border Collie mount, Boogie. Whiplash has entertained crowds at rodeos, ball games and events all across north America and Europe. He has starred in over 30 commercials including a series of television advertisements for the fast food chain Taco Johns. He has appeared on ESPN, Good Morning America and The Today Show. Whiplash has his own web site: www.whiplash thecowboymonkey.com and Facebook page: Whiplash The Cowboy Monkey. He can be followed on Instagram and Twitter @whiplash monkey. He has had over seven million views on You Tube. Whiplash’s traveling partner, Kenny Petet has his own impressive credentials and biography. Kenny grew up in southern Idaho. He was a long haired, Harley Davidson riding wild child who graduated college with a degree in Business. For four very long years as a banker – he decided this wasn’t the life for him. On a dare, he was initiated into the rodeo culture… riding broncs. His developing interest in rodeo led him to the highly respected Iowan stock contractor, Bob Barnes. Working with Barnes, Kenny experienced the world of rodeo hauling livestock, working as a pickup man, flank man behind the chutes as well as setting up the rodeos. At one point, Kenny found another new interest when he filled in for a missing bullfighter. At the suggestion of Mr. Barnes, Petet attended Shawn Davis Rodeo School during the off season. The next year, Petet worked 54 events for Barnes. After meeting and marrying his wife, Kenny relocated to Texas where he went to work for Neal Gay of the Rafter G Ranch and patriarch of the Gay family of world champion bull riders. His new life included hauling livestock, working as a ranch hand, bullfighter and rodeo clown for the next 11 years. Under Neal Gay’s mentorship, Petet created and ran several businesses based in the rodeo culture. Over the years, Petet has evolved into a production and entertainment entity – Speck Enterprises. He has been hired to provide in-house entertainment and assist in production during The National Finals Rodeo. Besides traveling with his close buddy, Whiplash, Kenny Petet’s bag of tricks includes rodeo clown and Chuckwagon Racing which were featured as the opening act at the 2010 National Finals Rodeo… world class entertainment. Join the excitement at the 2018 Kootenai River Stamped PRCA Rodeo. Presale tickets are an affordable $10 for adults. Tickets at the gate will be $15. Kids six and under are admitted free. This year there is a special price for seniors (age 55 and up) and students (age 7-15) of only $8. Tickets are available from the following ticket outlets until noon on July 27: Libby Area Chamber, Timberline Auto Center, High Spirits Liquor and Homesteaders Farm & Ranch Supply. In Troy, tickets can be obtained at The Silver Spur Restaurant. Gates open at 6 p.m. with rodeo action commencing at 8 p.m. July 27 and 28 at the J. Neils Rodeo Arena north of Libby off Hwy 37. Photos of Whiplash courtesy of Kootenai River Stampede.